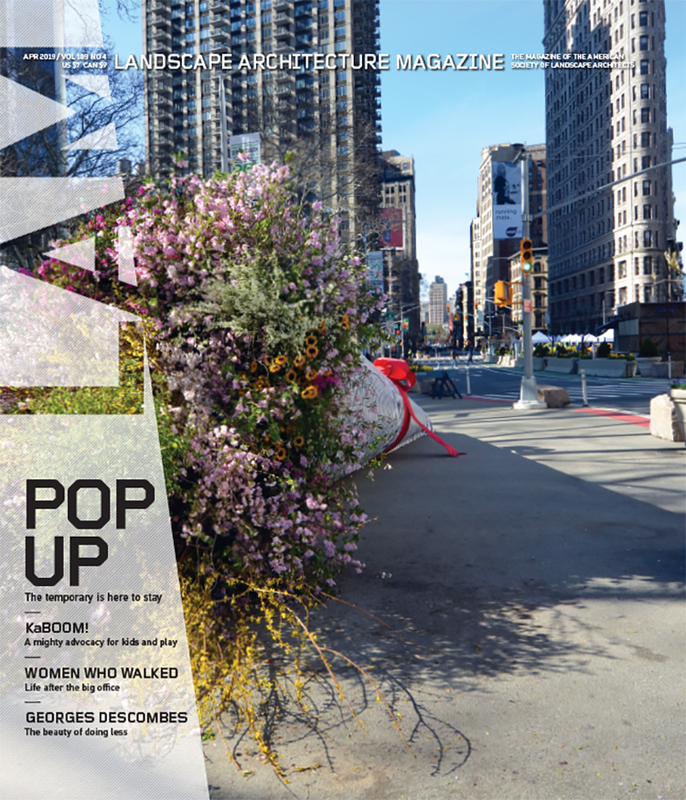 The LAM staff dives into this month’s news and views in the first Queue of the year, including a vacant lot project in Detroit that could unite barbers and landscape contractors, Brazil’s hopeful rails-to-trails project, and a collection of short films about the environment. • Hadley Arnold of the Arid Lands Institute (“Drylands Design for L.A.,” January 17, 2014) gets some NPR airtime talking about a drought-resistant future for L.A.
• The San Francisco Chronicle visits the Gallery + Ideas Forum at the Presidio Trust Headquarters, where the winning design for the Presidio parkland (“The Lucas Museum’s Rough Chicago Landing,” August 19, 2014; more), along with the four runners-up, are on display for public comment and review. • Four finalists for the National Parks Now, a National Park Service and Van Alen Institute (“Take Aim At New Orleans’s Vacant Land,” August 12, 2014) competition, were announced. Each finalist will receive a $15,000 stipend for implementing strategies that connect four parks to more diverse audiences. • Erin Kelly of Detroit Future City (“Detroit from the Ground Up,” LAM, November 2014) was among the 126 finalists for the Knight Cities Challenge, a competition created to generate beneficial design for 26 target communities in which the Knight family has newspapers. Out of a whopping 7,000 entries, her proposal for a barber and landscape team up for vacant lots in Detroit moved to the next stage. • Finnish Urbanism—it’s a thing. 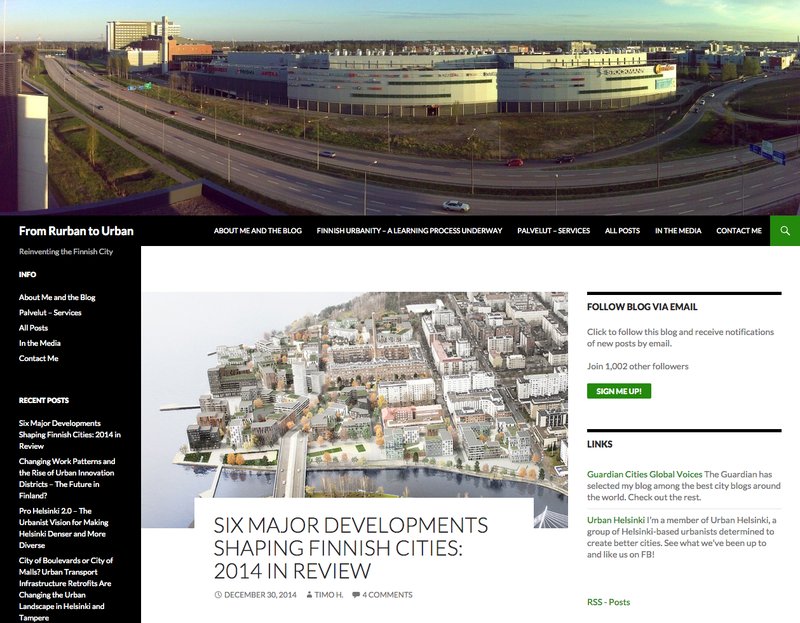 Timo Hämäläinen, an urban geographer based in Helsinki, helps us catch up with “Six Major Developments Shaping Finnish Cities in 2014” on his blog, From Rurban to Urban. • A group of residents in São Paulo hopes to see the Minhocão, a highway by day and cultural hub by night, repurposed into a rails-to-trails project for the local citizens. • Six companies in the Jiangsu province of China were recently fined 160 million yuan ($26 million) for dumping chemical waste into two Taizhou rivers. • Sam Adams, the former mayor of Portland, Oregon, was recently appointed as the new director of the U.S. Climate Initiative at the World Resources Institute. Adams was one of the key figures responsible for shaping Portland into one of the most sustainable cities in the United States. • A year after a drinking water disaster in Charleston, West Virginia, and after a lot of promises for regulatory reform, threats to drinking water supplies are not much diminished. • From February 28 to May 23, 2015, Lotusland in Montecito, California, will play host to FLOCK, a temporary installation that calls attention to the disappearing wild bird population, seen by many as an indicator for the loss in biodiversity. • The Rethinking the Urban Landscape exhibit looks at the benefits of landscape-focused urbanism through films, talks, and models. At the Building Centre in London through February 26, 2015. • Olafur Eliasson: Contact, a series of installations displaying Eliasson’s multidisciplinary “investigations into the mechanisms of perception and the construction of space,” is on view at Fondation Louis Vuitton in Paris through February 23, 2015. • Eight short films that play with the idea of perspective. • Think it’s expensive where you live? Try living in Greenland. • What’s inside an iceberg?